A proud queen sits upon her throne. Her body is turned away from the reader, instead she appears to be looking far into the distance, the expression on her face is stern. In her right hand she holds a sword upright, ready for battle. Known to be one who does not suffer fools gladly, she is incisive in her choice of words and her decisions. Storm clouds are building on the horizon, and trouble is blowing in on the strong winds. While contemplating this card I was reminded of another queen, one known as Boadicea, queen of the Iceni who led her people to a glorious war against the Romans between AD 61 and AD 63. Boadicea was so enraged at this violation that she rallied all the other neighbouring tribes and persuaded them to rise up with the Iceni against the mighty Rome. She started a revolution that took the Romans by surprise, because while the Iceni was too small a tribe to challenge Rome alone, in their common cause the neighbouring tribes with the Iceni were large and fierce enough to create a lot of trouble for Rome. Boadicea and her people burnt down many Roman towns to the ground including London. She was one pissed-off queen! Fuelled by her anger and her desire for revenge she took on the might of Rome. Being tribal warriors Boadicea’s troops had no particular battle strategy, instead they fiercely rushed in where others would not dare to go, taking the Roman troops by surprise, time and again. This non-strategy approach worked well at first. The Roman troops were repeatedly taken by surprise, defeated and humiliated until they eventually brought in battle-hardened soldier troops to defeat her. Back to the Queen of Swords card we see a butterfly adorning her throne. We also notice that she wears a bell, dangling from her left wrist. The butterfly has come to symbolize a metamorphosis in many cultures, it heralds in something new and also symbolizes time along with many other things. The bell is used by the church to call people in, it is also used in occult circles to ward off unwanted influences. And it signals that the time has arrived for church service or occult ritual to begin. There comes a time in most of our lives when we are prompted to stand up against injustices and violations of our rights or the rights of those who are weak and helpless. There is nothing wrong with standing up for our rights, it is a necessary action to ensure that the world we live in is just and the governments that rule are held accountable. However, like the Queens in tarot we need to exercise wisdom by choosing our battles carefully and to know when to leave well alone. 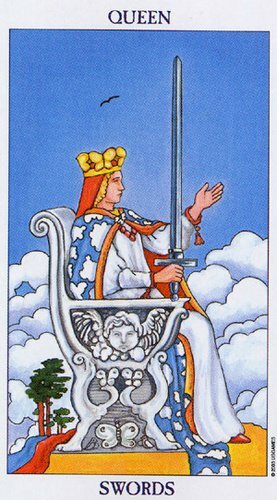 Being a card of Swords we know that this queen is able to articulate herself eloquently and to use the power of the word to persuade others to follow her example, instead of allowing anger to drive her. Perhaps a lesson that we can draw from this card is to ensure that we have a strategy before going into battle. We may want to choose our words carefully and with firm determination execute a stern but strategic challenge against the bullies of our society to ensure that we are heard and not defeated in the process. We may be wise to seek opportunities to communicate our concerns, and while we should not shy away from a challenge that can benefit from our input, giving into uncontrolled anger will only serve to hurt us and others in the process. It might be wiser to remember that the pen (or in this case the tongue) is far mightier than the sword.